Deepika Padukone and Ranveer Singh have been in the headlines for their personal reasons more than the professional ones. Since the famous 'DeepVeer' wedding at Lake Como, their husband-wife moments are being published in the tabloids and publications every now and then. Her latest post was just another one of them. DP posted a throwback picture from her childhood where she is seen eating. She 'forever hungry...& nothing’s changed!' The Simmba actor was quick to reply. Deepika Padukone and Vikrant Massey's LEAKED Scene from Chhapaak Shoot in Delhi Shows Them In an Important Conversation. We all know by now, that Ranveer is head over heels in love with the dimpled beauty. Their each and every post receives a reaction from each other and their true fans live for it! Also, does this mean that she is not much conscious about her diet as much as her fans thought? So, on this picture, where the Piku actress said that she is forever hungry, he said, "I can vouch for that! Nothing's changed!." The couple that was tight-lipped about their relationship for several years, is suddenly full of social media PDA. Their Instagram community loves their banter too. Check out the post below. It is not just their marriage but their respective films too are buzzing on the internet. 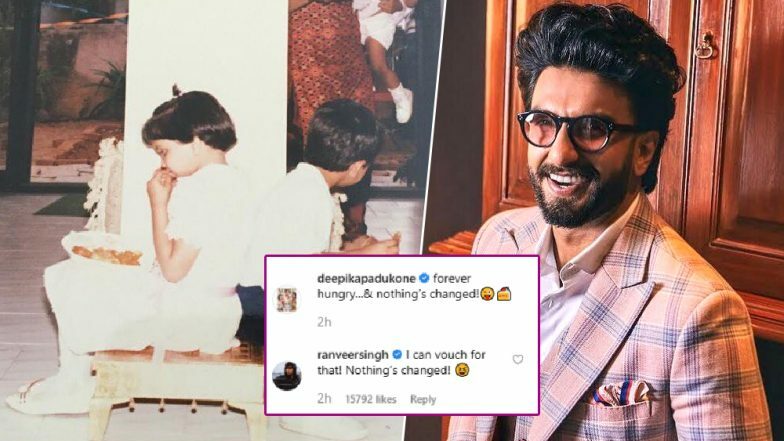 Ranveer's fans are not even over the Gully Boy zone and here he is with his prep for cricket-based film 83. Deepika is making the jaws drop with her'Malti' look in Chhapaak. Her uncanny resemblance with acid attack survivor, Laxmi Aggarwal in this film based on her life, broke the internet. So there's a lot to look forward to from this couple's end, other than their mushy conversations. Stay tuned to stay updated.